It took the Republicans seven years to craft that?! 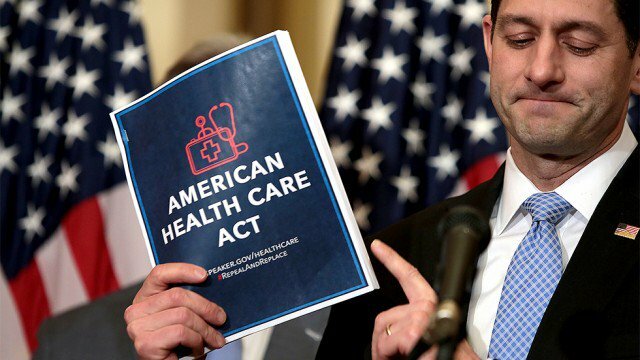 The new GOP bill to replace the Affordable Care Act is pretty pathetic. Even the name is oddly flat. I was expecting something more like the "Make America Healthy Again Act"? On the plus side, it's not just Democrats who dislike it. Lots of conservatives are enraged by it, too, albeit for completely different reasons. Your task today is to urge your Representative to reject it. 1. Find your Rep's number(s) here (and add them all to your activism cheat sheet or create a contact in your phone if you haven't already). You may have to call more than one office to get through. "Hi, my name is NAME. I'm a constituent calling from TOWN/CITY. I'm calling to urge Rep. NAME to reject the new Republican bill to replace the Affordable Care Act. I find it very disturbing that this new bill (the American Health Care Act) would result in many Americans, including those here in our district losing health coverage. The bill would have the worst impact on the elderly and the poor - the very people who need the most help. Replacing government subsidies with tax credits only helps people who are making enough money to pay taxes. The bill will also take insurance away from millions of individuals and cripple state budgets by phasing out the Medicaid expansion. In addition, this bill is playing partisan politics with women's health by including a completely unnecessary provision to defund Planned Parenthood which provides affordable routine health care services like breast exams and pap smears that help protect millions of women from cancer. Since Planned Parenthood ALREADY does not receive federal funding for abortions this provision is clearly a spiteful, politically-motivated ploy that will only end up hurting women - especially lower-income women. I also think it's incredibly irresponsible for the Republicans to be rushing this bill without first having it scored by the Congressional Budget Office so that people can see how much it will cost and how many people will lose coverage." 3. Then contact your Rep. via their website contact form. If you're on Facebook and Twitter, share your thoughts with them there, too. 4. Share this action with anyone you know who shares your politics. If you'd like to read more about the bill, you can find the full text of the bill here. And below are links to some articles about it.